The Naples-Afragola station is aimed at improving the mobility in the metropolitan area of Naples. Image: © Zaha Hadid Office. The design of the Naples-Afragola station is based on an innovative bridge concept. Image: © Zaha Hadid Office. The station structure mimics a train on the move. Image: © Zaha Hadid Office. Naples-Afragola is a proposed high-speed railway station in the city of Naples, Italy. Italy’s state-owned railway network operator Rete Ferroviaria Italiana (RFI) is responsible for the implementation of the project. The plans to build the station were first revealed in 2003, but the project was kept on hold due to budgetary constraints. The construction contract for the project was awarded to Italian multinational construction company Astaldi Group in February 2015. With the aim of improving public transportation in the metropolitan area, the station will be used by all high-speed trains on the Rome-Naples high-speed line and will be integrated with major roads and regional railway lines, serving as an interchange between high-speed and local services. Naples-Afragola will become the first and main project of the urban development plan, designed to develop and upgrade the entire area with projects such as high-tech laboratories, centres for agricultural experimentation, sports equipment, and a large exhibition centre. London-based Zaha Hadid Architects designed the Naples-Afragola station to combine nature and technology. High-speed electric multiple unit, manufactured by TREno Veloce Italiano (TREVI). Also known as ‘bridge above the tracks’, the design features an innovative bridge concept. The station will be comparable to a 400m aerial bridge, which will cross over platforms without intruding upon the landscape or road network. The bridge will be formed by enlarging the overhead concourse, which will also serve as the main passenger concourse. The main building will be covered with large glass panels in winding shapes, making the structure similar to a moving train. The new high-speed station will be located 3km north of the city centre. It will become a gateway to the city while serving as a catalyst for future development. 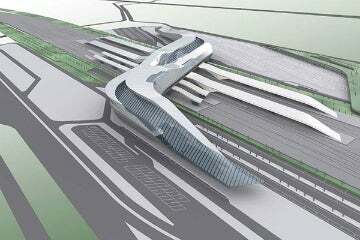 The four-level station building will occupy an area of 20,000m², with the possibility of a 10,000m² extension. It will measure 2.7m (9ft) high and incline at both ends, allowing passenger flow between several areas of the station, directing them to their trains. "Two strips of extended park-land will run alongside the tracks throughout the station site, connecting the station to the surrounding landscape and business park." Two strips of extended park-land will run alongside the tracks throughout the station site, connecting the station to the surrounding landscape and business park. Customer amenities and other services will be housed in bright and wide corridors, which will contain retail outlets and other businesses. The station will feature 1,400 car parking spaces, a bus station, and restaurants, bars and cafés located above the waiting area. The contract was awarded to Zaha Hadid Architects in 2003. The company released the initial designs for the project in the subsequent years. Astaldi Group received a €61m ($68.5m) order for the construction of the station in February 2015. The agreement includes completion of the building, station works and other railway system works. The construction commenced in the second half of 2015 and is scheduled to conclude in approximately 24 months.